I’m going to be completely frank with you, there’s probably way more you could fit into a day in Vienna than what I did. In fact, I’m even including a little list of places I didn’t go that would still fit into your day at the end of this post. But given that this little trip was at the end of my 3 days/3 cities extravaganza, I was a little bit exhausted at this point. It didn’t help that it was rainy, which kind of killed the whole walking-outdoors-for-extended-periods-of-time thing. 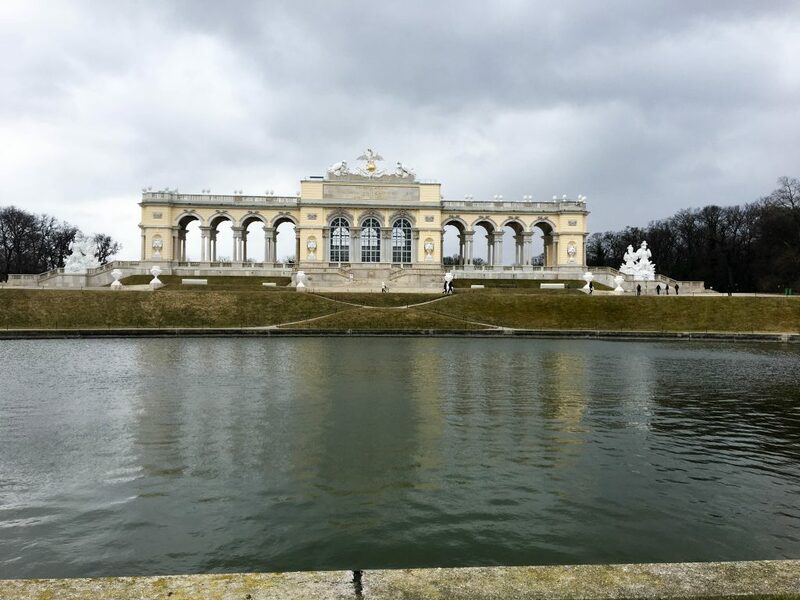 Nonetheless, I still wanted to share some of the amazing things I saw during my one day in Vienna. Now, I’ve seen some pretty hipster/snobby coffee shops in my day, but this one certainly takes the cake. They have approximately 12 varieties of espresso and refuse to let customers order drinks to-go. However, this behavior is well justified if for no other reason that the fact that the coffee is phenomenal. Like, I almost cried, that’s how good it was. Honestly, a pretty solid way to start a day if you ask me. Brief moment of appreciation for how dramatic the skies are in this picture slash every picture I took that day. 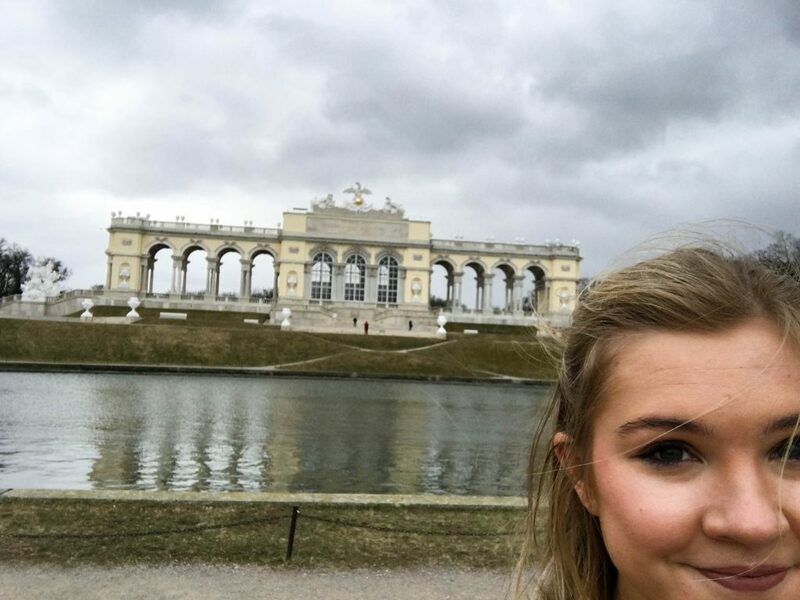 Schönbrunn isn’t exactly near anything in the city, so you kind of have to go out of your way for that one. 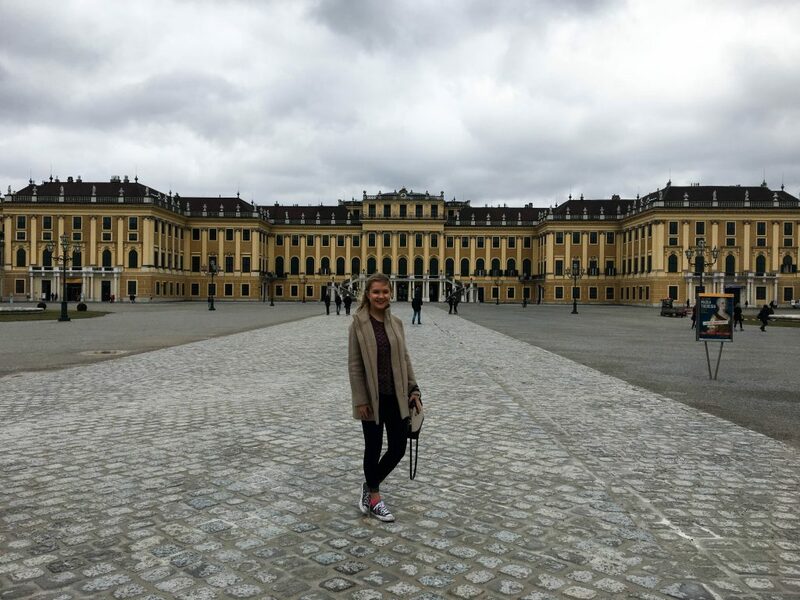 However, it’s worth it purely because the palace is so pretty and there’s a lovely little courtyard out back that you can walk around. The café there is a little overpriced but I got a bomb apple strudel that arguably would’ve been better suited as a dessert rather than a breakfast (but I loved it nonetheless). Also, I got to climb a hill and take a picture on top of it. It’s the little things. 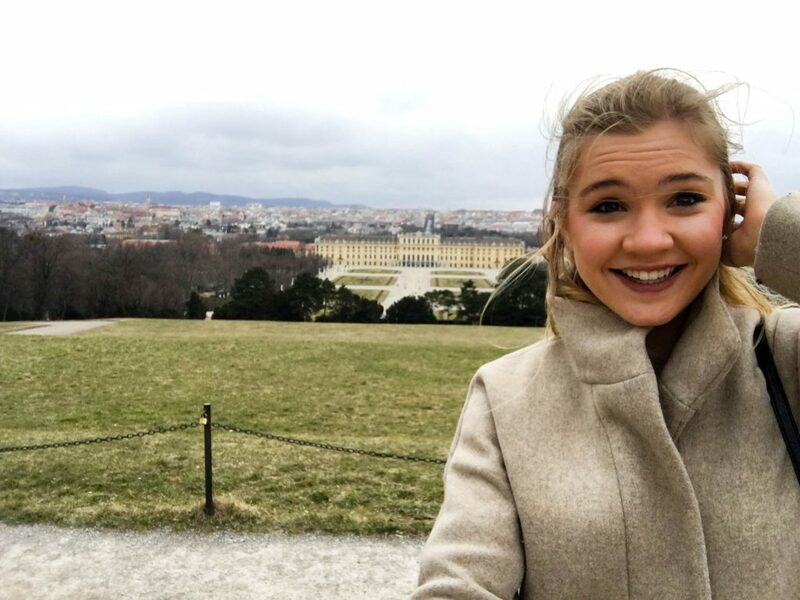 On top of the aforementioned hill is a gorgeous gloriette with a fantastic view of the palace. I stood up here spinning around like an idiot with my selfie stick, but that’s only because there was such a pretty scene from every. single. angle. 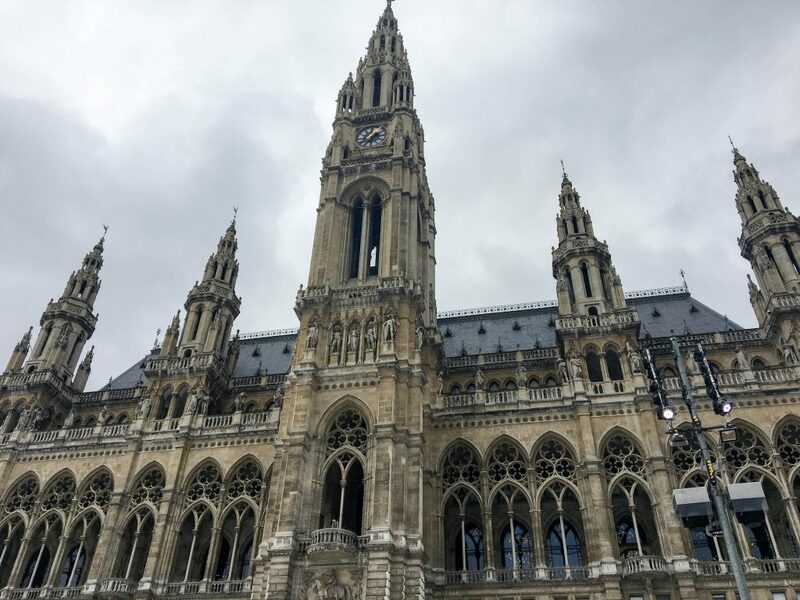 After taking an Uber back into the central part of the city, I visited the city hall (I still find it funny that the German word for that is rathaus – it doesn’t exactly paint a pretty picture of the politicians working inside of it, now does it). The building is stunning and worth a walk around the outside to admire the architecture from all sides. There was also a skating rink and little market in the plaza immediately in front of the building. I avoided the skating rink, but since it was chilly and a little damp out, I got a fantastic mulled wine from one of the vendors to warm up a little. If I thought the museum center in Berlin was huge, this one completely blew Berlin out of the water. 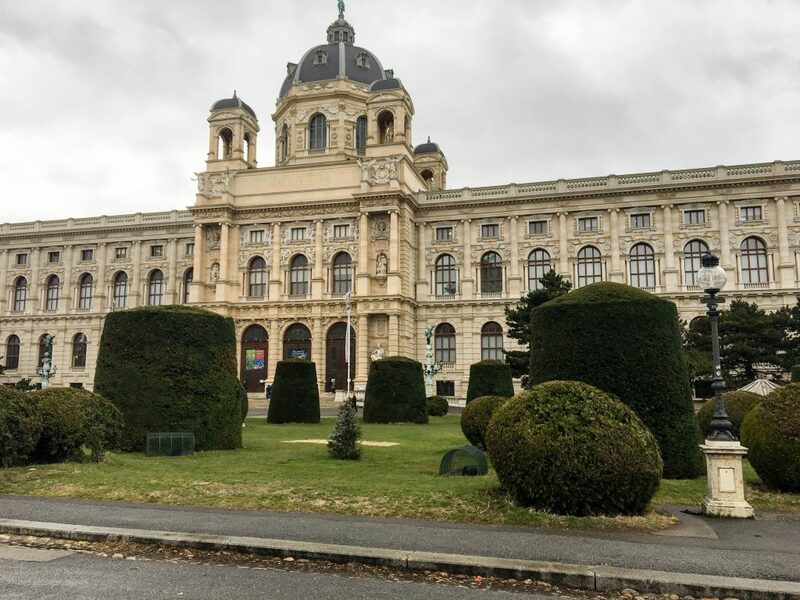 There was a fantastic number of museums, along with a variety of restaurants. Had I been staying late into the night, this looks like an excellent place to go for a drink. I took a little shelter from the rain by walking through the Leopold Museum, which is a huge modern art museum. More palaces, because why not. To be honest, most of the imperial parts of the city are stunning, not just the palaces. I basically spent most of the afternoon wandering around admiring all of the buildings. Even pictures can’t do justice to the level of detail and intricacy put into the designs of these buildings. As explained earlier, I was so completely exhausted from three days of intense sight-seeing that I basically cut my day short by holing up in a café with a book for hours. It also didn’t help that it practically started pouring outside. As a result, I ended up in this cute café and probably overstayed my welcome by sitting there reading for so long, but in my defense, it wasn’t too crowded so I wasn’t taking a table from anyone or anything like that. 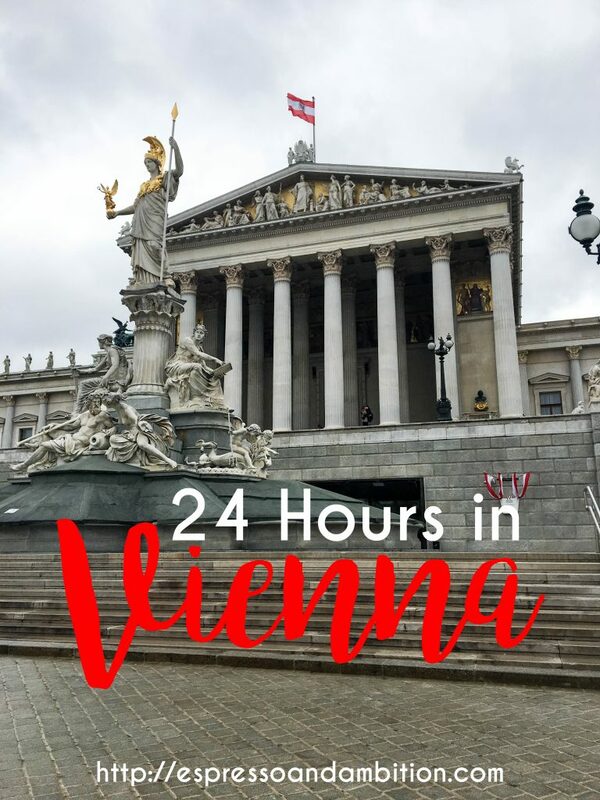 Opera – the city is known for its gorgeous opera houses, so if you can, try to snag one of the inexpensively priced tickets, put on a nice outfit, and go experience some of the culture. The last-minute nature of my trip meant that my options were to pay $150 or don’t go at all, so I chose the latter. Mozart House – if you’re a music fan, this place is supposedly really interesting. However, I know little about Mozart and just couldn’t justify the long walk in the rain to see a relatively bare house. Spanish Riding School – once again, this was a matter of money. It’s pretty expensive to visit and watch, so I opted out, but if you’re looking for something else to do and don’t mind spending a pretty penny on it, go for it! Anyways, we’ve officially reached the end of my three-part series of seeing European cities in 24 hours. Hope you’ve enjoyed it!